Guests often ask me, “Do you ever sit down”? Seems I must be moving all the time. While we do lead very busy lives, both Bruce and I can often be found sitting with guests in the evening and occasionally catching a show or two in the area. So when the Rainbow Dinner Theatre sent an offer to tourism businesses for a free dinner and show, several innkeepers responded and could be found laughing away the hours at their show, Felix and Oscar, last Sunday afternoon. Dave and Cindy Disavino have operated the dinner theatre for 25 years, and it’s clear that they enjoy what they do. Audiences respond to their work with enthusiasm -- the show was packed. We especially liked Gerry Konjura, who played Oscar. If you closed your eyes, you could almost feel Walter Matthau’s presence from the original version of the play. One favorite scene shows Oscar looking for tax receipts and emptying his pockets – all innkeepers can relate as we scramble to pull together our expenses, and brace ourselves for April 15. Speaking of taxes, I’d better get back to another sitting – in front of the computer with numbers…. Neil Simon’s masterpiece will be playing through April 25 – call The Artist’s Inn for special discounts on shows. Thank you, Rainbow Dinner Theatre, for a fun day. I couldn’t fight it anymore. I saw the lights on late at night. I knew what they were doing in there. I’ve driven by the signs, fighting the urge to turn in. On quiet days I could hear them call me by name. And once the weather broke a little last week, I was overcome with desire. My willpower caved, my resistance forgotten and I just had to go. And so began my visits to the nurseries. 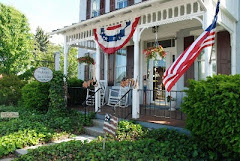 They surround The Artist’s Inn in Terre Hill, and range from small mom-and-pop greenhouses that are only open until they sell out their inventory, to large wholesalers like Frysville Farms that grow 500,000 mums in the fall and just as many poinsettias at Christmas time. 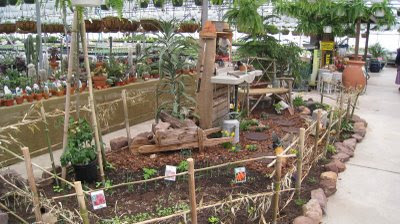 One thing all the greenhouse owners have in common – they are passionate about their love of growing plants and very knowledgeable about what they do. Oh what a treat it was. As you walk through the door, you’re greeted by green, green, green in every direction. It’s the promise of Spring and all the hope it brings. You can feel the mist and rise in humidity as it falls from the overhead sprinklers (and straightens your hair), smell the herbs as you explore new varieties, and almost hear those happy little leaves growing as they gobble up the nutrients in the soil. It is a bit of a tease, as it’s really too early to plant anything. But oh, the dreams these trips feed. Your mind races as it tries to visually place flowers in just the right conditions in your gardens. I usually explore Lancaster County greenhouses with my two innkeeping buddies, Ruth from Flowers and Thyme, and Carl from Harvest Moon. Together we have found many treasures for our yards, taking notes about new varieties, adjusting our lists of what we want more than need, pulling our wagons through the perennial beds, up the gravel lots to the annuals, oohing and ahhing our way through and cramming our cars full of newfound plants like excited kids on a scavenger hunt. 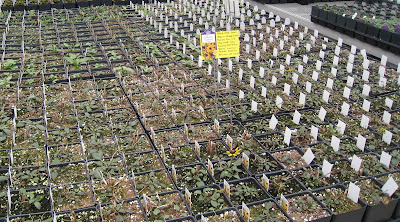 Some of the greenhouses have come to know us (is that why they call for more help as we head for the check-out?) – we certainly do not go unnoticed at many. Between the three of us, we can usually talk about our past success (or not) with most plants, discussing the benefits, the drawbacks, the pests and the blooming cycle. Of course, my specialty seems to be finding plants that take over your garden, encroach on your neighbors and seed half the town….but that’s a blog for another day. We clog the aisles, get caught in the rain, pull carts through the mud, and wolf down lunch along the way, all the while answering our cell phones and taking reservations. Ah, but those trips are a few more weeks away, and we still have a little time yet to prepare for our annual trek around the county. 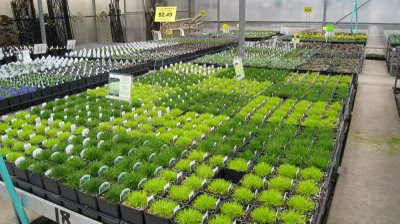 So make your lists and plan now to take advantage of the best selections that our local nurseries offer. Weaverland Auction, just a mile from the inn, will soon be opening, offering wholesale prices and breathtaking displays if you can buy in bulk. Black Creek is now open year round and we had a nice conversation with the owner about what is new on the herb scene. Actually, we were working on research for our Herb Tour on May 9, but that is another blog for another day. They always have a great display. That is where these pictures are from – I love the brave little flower blooming its heart out - do you see it? It’s certainly bigger than the leaves and stem that support it. Your list of local greenhouses that surround the inn, complete with directions, is waiting. And if you listen closely, you can hear those plants calling you. They know your name. We hope to see you soon. In the garden! After all, Spring is just around the corner. In our never-ending quest to discover the culinary treasures of Lancaster County, Carl and I visited the new tasting room at Tamanend Winery. This winery is named in honor of the Chief of the Delaware Tribe of Indians, who signed a treaty with William Penn for land that became Penn's Woods, or Pennsylvania. Never judge a book by its cover: Although the setting of the winery is based across the street from a Mercedes dealer, the tasting room inside, with Kate Albert as our guide, soon made you forget those cars! We learned about their Wild Wines first. Named after Pennsylvania wildflowers, these have labels that picture scenes photographed by the owners – some in their own backyard. These wines are sold in a bag-in-box, a method becoming more popular –because it limits the amount of wine that is exposed to oxygen, thereby extending the “life” of the wine. The premium wine labels are beautiful too – and truly works of art. They are taken from original paintings by Suk Shuglie. All the wines are made from Pennsylvania grapes – with the exception of their Torosa Zinfandel and the Trop, a dessert wine made from the same California zinfandel grapes. Ironically, these were my two favorites - what can I say, I’m a California red girl at heart. All their wines tended to be more on the dry side (yeah!) with a nice clean finish. Yummy. It was about that time that we met Dr. Richard Carey. He owns the winery with his wife, Linda Jones McKee, and also runs the Vitis Wine Center that services the mid-Atlantic region. Say you own a vineyard and something goes wrong along the way….perhaps your wine has too much alcohol, or you just can’t figure out what went awry. This Wine Wizard helps you figure out the problem – and correct it. 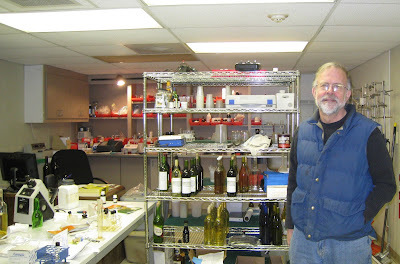 He says, “Wine is half science and half art and the trouble is that we don’t know which is which!” We think his love of both science and art are apparent in his wines…Here’s a picture of him in his lab. We got a peek at a machine that helps him – it looked to be right out of the Wizard of Oz – full of dials and controls…I thought I heard a faint voice in the background saying “don’t touch those dials” ….but maybe that was the wine talking. There's a new research project that he’s trying – storing wine in big white plastic “tubs” instead of the traditional French or American oak barrels. The plastic allows the same amount of oxygen exchange as the oak, but lasts 20 years, instead of 3. (Wow, very green indeed.) It also provides a better barrier for temperature fluctuations. I never knew I liked science so much! 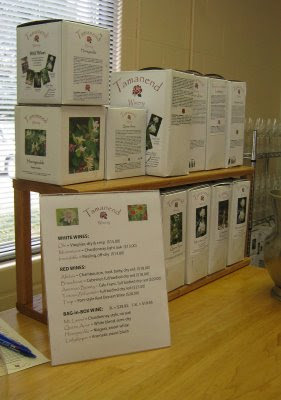 We hope to have Tamenand on one of our Lancaster County Tours later this year, so stay tuned for details. Weeknights during the winter are not quite the busiest time of the year for The Artist’s Inn, so it’s a perfect excuse for Bruce and me to try new restaurants. We had heard about Effie Ophelia’s last summer during our Wine Camp, but couldn’t remember the name! When talk of the restaurant surfaced again, and we found that friends of ours, Lynne and Bob Griffin of the Australian Walkabout, also wanted to eat there - and when they were able to get a sitter at the last-minute - well, it just seemed like fate that we should go. Named for Eric Howton’s (the owner) grandmother, it’s a tiny bistro of about ten tables in downtown Lancaster. One of the rare, “bring-your-own bottle” restaurants, Effie Ophelia’s is a great place to enjoy the German Riesling that the Griffins brought. Our bottle of a French blend – even though it had a great looking label (my test of whether or not to buy a new wine) - fell short of expectations. But the food did not. I could have dived into my appetizer - sweet potato gnocchi with sage cream and candied pecans. It was a heavenly mix of textures and sweetness. The roasted root vegetables, chevre gratin with spinach cream, tasted as wonderful as it was beautiful. 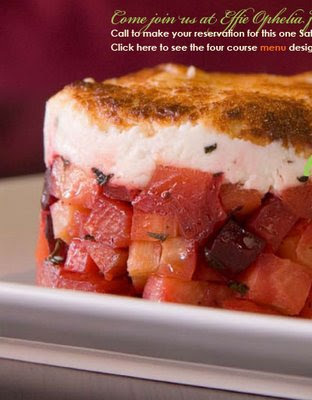 It’s featured on the home page of their website and pictured here. We all liked our main courses as well, the pan seared trout with herbed spaetzle and shitake leek cream, lime-ginger roasted chicken with carrot and golden raisin mostarda, and the chiles rellenos, with citrus and white bean puree and tomato coulis. I had the seared diver scallops with cilantro crisped hominy and pickled pepper pot – the portion was quite generous. The spicy bite of the scallops danced so well with the sweetness of the peppers. We sipped tea while our friends polished off a serving of cream brulee. It looked yummy and next time I hope to try it. I thought I had a small kitchen, but Eric does very well in what little space he has – the “kitchen” is open to the restaurant and about the size of a broom closet, albeit a stainless steel one. No matter, people still like to go up to him and talk while he is whirring around. Hey, I know what that’s like! You can bet we’ll be back and will certainly recommend it to our guests….although they don’t take reservations, so there may be quite a wait. But it’s a nice neighborhood to window shop – they are on gallery row. We have the menu here at The Artist’s Inn, though entrees change frequently. Now, if we can just remember the name!